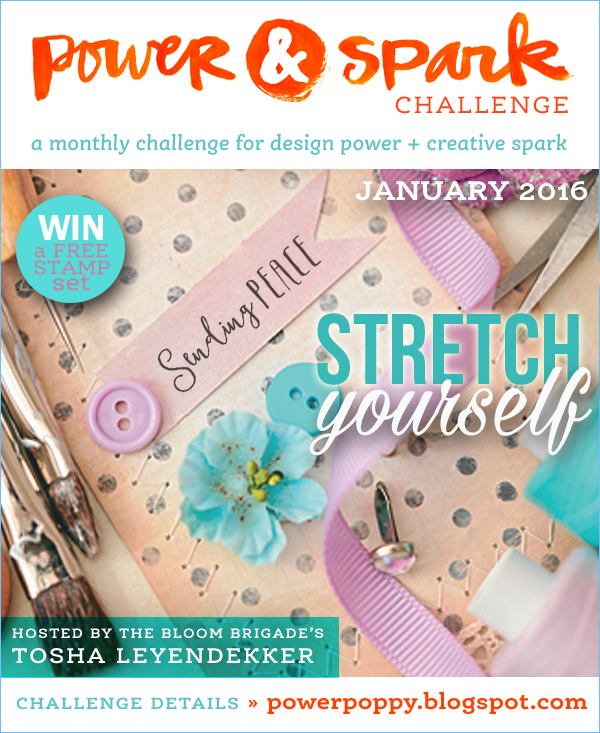 Welcome to a new challenge from Power Poppy to kick off 2016 with a bang! In the theme of all that new fitness people are engaging in we thought we’d STRETCH you a little bit! Tosha is our hostess this month and she’s challenging you DOUBLY. We want you to stretch yourself by using a tall card format, along with a something new you've been wanting to try (like a technique), but haven't yet. 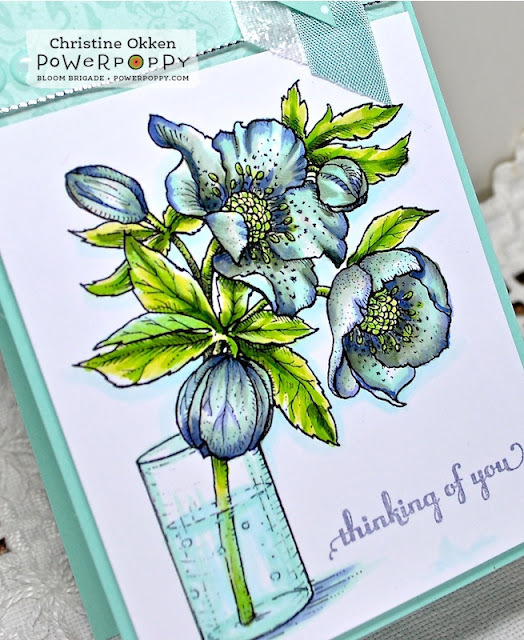 Today I’ve got a TALL card and a beautiful brand new digi set from Power Poppy to show off, Hellebores. 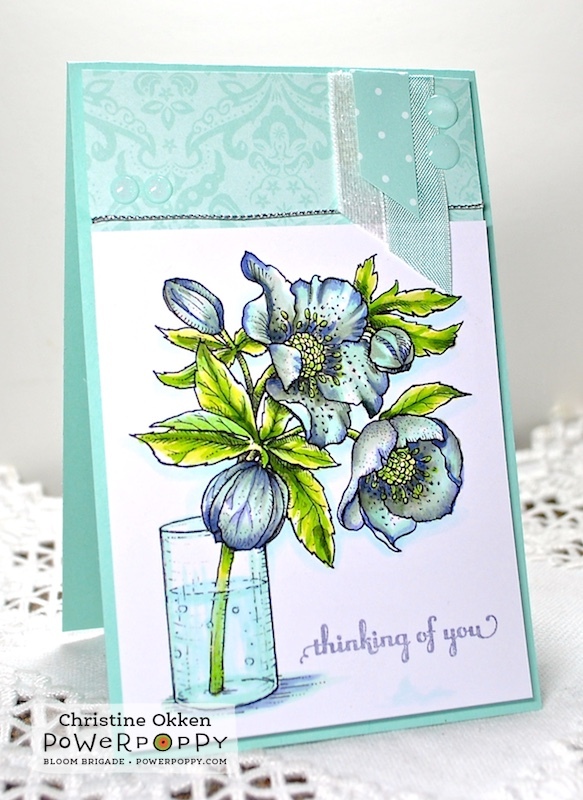 How gorgeous Hellebore (or Lenten Rose) are! I really love that a number of their varieties come in green which is one of my favourite colours. Today I wanted to do something new and go for a totally unique colour palette that was a bit unexpected. As Marcy said on her post about this new digi, there are a lot of colour varieties to choose from. 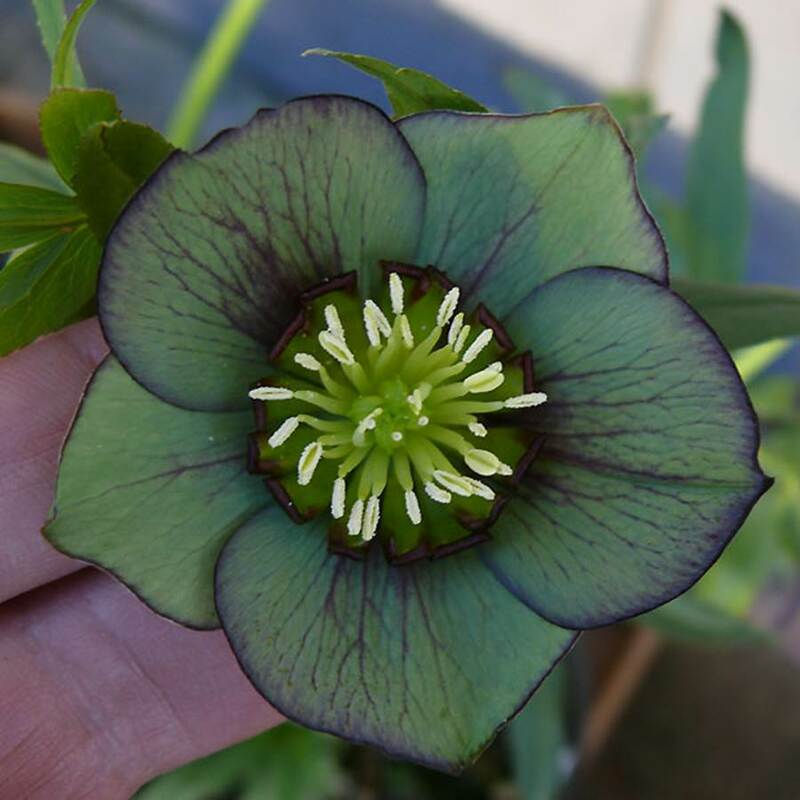 I found a hellebore that is a lovely shade of jade that has purple edges and veining. I went a little more aqua than jade in my colouring, but it was sure fun to put these colours together. For the tall design, this card measures 3 1/2 x 5 1/5. I like this size of tall card best because it still fits into a standard A2 envelope. To accent I added some shimmery white ribbon, seam binding and some enamel dots, with a slip of silver cording. Isn’t that a neat colour combination? The sentiment is from our Dynamic Duos: Peonies and Tulips set, I’m trying to have more all-occasion cards in my stash, BUT Marcy has a lovely quote that goes with this digi. And here’s what this pretty digi looks like. 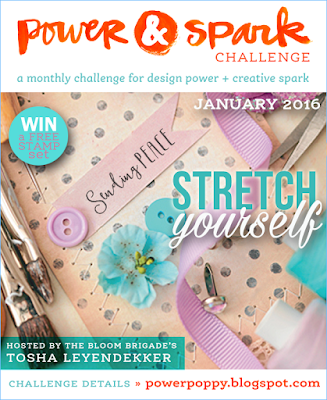 Now pop on over to see the rest of the Bloom Brigade playing along with today in the STRETCH Yourself Challenge, we hope you join us! The challenge runs all month long and you could win a Power Poppy set of your choice! Absolutely gorgeous! Love this colour combo - so very pretty! Fabulous layout as well. Just beautiful Christine. Soft and feminine. Cheers. Beautiful, Christine! The sentiment looks great with it. Love the color of those blooms. Gorgeous Christine! The colors are awesome... very soothing. Gorgeous. Just beautiful, Christine. Your coloring reflects your beauty within. I love the way you used the ribbon! Oh, Christine, your tall card is gorgeous, and I love the ribbon with the rhinestones at top. And your color combination for the hellebore is gorgeous and so wonderfully inspired by the photo you found! It truly was such fun to see all the beautiful colors they grow. Your color is always out of this world and so dreamy, and I love seeing all the fine details in the flower veins, etc. Stunning card! Hugs! Gorgeous card. Love the pretty image and the colors. Quite stunning Christine! Love the colors you chose and especially your coloring!